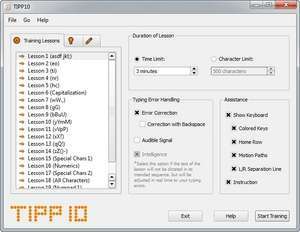 TIPP10 makes PC (and by extension, MAC) computer users ready for the ten-finger system on the keyboard. Train with the free software for both beginners and advanced fast typing. TIPP10 holds provides several exercises. Beginners start with basic training, while advanced typists exercise their skills on a complete block of text. Version 2.1.0 is a freeware program which does not have restrictions and it's free so it doesn't cost anything. For security reasons, you should also check out the TIPP10 download at LO4D.com which includes virus and malware tests. Additional screenshots of this application download may be available, too. Improve your teaching and learning with these useful and highly rated educational software downloads. Tech support is provided by user forums on Canadian Content. Check out some of the freeware downloads available in the education software category. They contain no strings and are available at zero cost. 4.5 out of 5 based on 13 ratings.